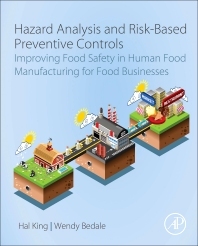 Hazard Analysis and Risk-Based Preventive Controls: Improving Food Safety in Human Food Manufacturing for Food Businesses is a comprehensive, first of its kind resource for the retail food industry on the Hazard Analysis and Risk-based Preventive Controls (PCHF) regulations of the Food Safety Modernization Act (FSMA). This book covers all aspects of PCHF, including the legislation's intent, applications to ensure safe food production, and resources to keep up-to-date on new food safety hazards and regulatory guidance. Written for food safety professionals and food business leaders, its emphasis on what the retail food industry needs to know about PCHF make it an indispensable resource for organizations buying food from companies required to demonstrate compliance with PCHF. PCHF implementation is (or soon will be) required for human food companies along the supply chain in the United States, as well as all food companies that import ingredients and products for human consumption into the U.S.
Chapter Three: What potential food ingredient hazards occur in human food manufacturing? Chapter Four: What and where are potential process- and facility-related hazards introduced into foods during human food manufacturing? With an extensive background in the food safety management of supply chain, distribution and restaurant operations, Dr. King now focuses on the design and development of food safety management systems, and on the innovation of new food safety services and products that will help the food industry implement best in class food safety programs in their business. Wendy Bedale worked in a variety of clinical, regulatory, and project management roles in the pharmaceutical, medical device, and biotechnology industries before taking a position that fulfilled two of her passions (scientific writing and food) at the Food Research Institute (FRI) at the University of Wisconsin-Madison. Since then, she has written about many aspects of food safety for a variety of audiences. lots of terrific context and data but more specifics on preventing the controls would have been helpful. Only an abbreviated context of this was presented. The Authors thank the reader for their review and comments. We did discuss many hazards and their respective preventive controls in the book (and provided references that list other previously described hazard/preventive control pairs). However, the purpose of the book was to teach others how to identify potential hazards and develop appropriate preventive controls for their own manufacturing processes rather than to exhaustively list all potential hazards and preventive controls that might be used in human food manufacturing.